Self Temperation Society 2.2% Brewed with a specially selected yeast strain to produce a low ABV beer with a surprisingly satisfying amount of body and taste. Canny Sculler 3.8% A refreshing golden session ale with a full malt body and a pronounced spicy hop aroma derived from the continental Brewers Gold hops. Byker Blonde 4.0% Bright citrus notes with light malt and bitterness. 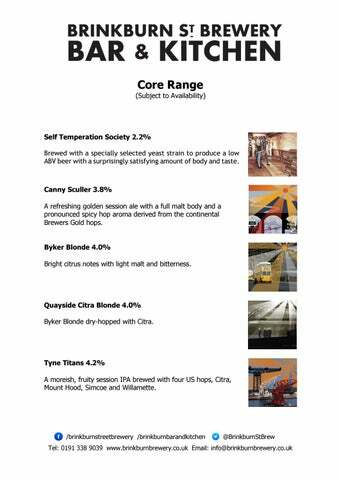 Quayside Citra Blonde 4.0% Byker Blonde dry-hopped with Citra. Tyne Titans 4.2% A moreish, fruity session IPA brewed with four US hops, Citra, Mount Hood, Simcoe and Willamette. Ford St IPA 4.7% Our take on a classic West Coast US-style IPA. 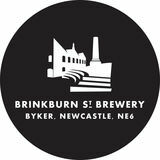 Byker Brown Ale 4.8% A balanced malty and hoppy brew with chocolate and biscuit notes. Geordie Pagoda 4.8% A light yet robust pale ale. This is brewed with Sorachi Ace and Azacca hops to provide a wonderfully balanced and refreshing citrus taste with a hint of coconut and floral flavours. Ford Street Porter 5.0% Ford Street Porter is a luxuriant dark beer offering the full spectrum of malted (and some unmalted) cereals. This rounded mixture is balanced with a delicate hop profile to offer a refreshing thirst quencher. Homage to Mesopotamia 5.2% Homage to Mesopotamia is a luxuriant porter with late additions of Shiraz grape juice and honey to balance the chocolate malt. Sons of Ragnar 4.5% (500ml) A â&#x20AC;&#x2DC;sessionâ&#x20AC;&#x2122; strength version of our popular Ragnar Lothbrok, featuring Cara Red and Crystal Rye Malts, with Amarillo and Galena hops. Old North Road ESB 5.5% Brewed in collaboration with our friends at Steam Machine this traditional UK style using heritage malt, is tweaked with US hop varieties. Little House of the Rising Sun 5.5% Smooth dark chocolate maltiness leading to a gathering raspberry flavour, with a hint of coconut on the finish. A lower ABV version of our award-winning House of the Rising Sun Imperial. Hop Gremlin 5.6% Complex tropical fruit tones balanced with a very hoppy dry linger. House of the Rising Sun Imperial 10.0% This special winter porter is an imperial strength version of our popular House of The Rising Sun chocolate raspberry porter. Clandestine 11.0% Rich and luxuriant, wood barrel-aged, imperial milk stout.